The next generation seem to be passing on the ANZAC legend with Miranda Public School producing an amazing short film about young soldiers at Gallipoli. Every ANZAC Day, Australians and New Zealanders love to replicate the activities done our brave troops did when guns were down on the front line. Many Aussies and Kiwis partake in the tradition of two up, the heads-or-tails coin game played to pass the time. We all also have heard many tales of the staple food of the Diggers, the beloved ANZAC biscuit. However, despite the popular belief there is actually no evidence that our soldiers at Gallipoli ever received the oats-filled (see the full ANZAC biscuit recipe further down this page) bickies that have become an Aussie icon. The standard Army biscuit the Diggers did consume on the front line – also referred to as the ANZAC’s biscuits - was reportedly a rock hard, tooth breaking baked item. Not the chewy biscuit we all know an ANZAC biscuit to be. There is evidence of soldiers on the Western Front in France and Belgium receiving biscuits with oats in them, but it wasn’t widespread among the 295,000 ANZACs fighting there either. What in fact made these biscuits so popular and why they’re named ANZAC biscuits is that they were sold at fetes, galas, parades etc back home in Australia and New Zealand to raise funds for the war effort. Though they were referred to at the time as “soldier’s biscuits”. Of course after Gallipoli, New Zealand and Australian troops adopted the name ANZACs and so did the biscuits made in their honour. 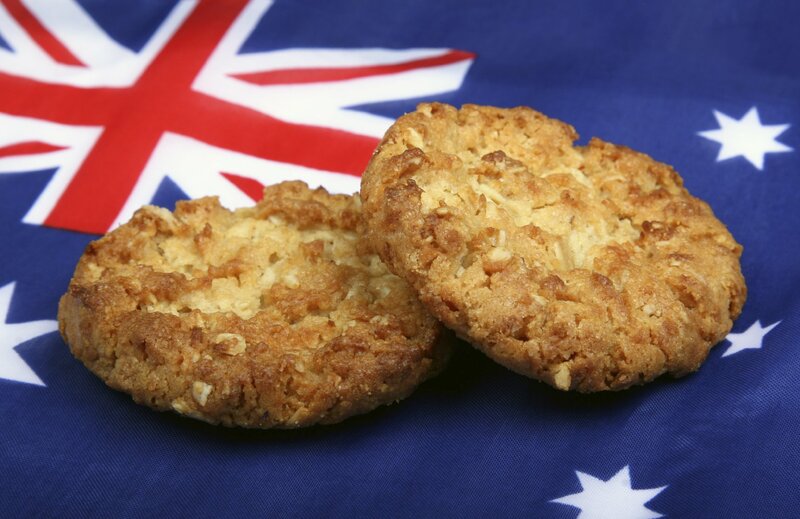 The first mention in a cookbook of ANZAC biscuits was in 1921, about three years after the war had finished. The ANZAC name is one that is highly protected and respected Down Under. In 1916 it became protected by law and you cannot name anything with the acronym without permission. Biscuits sold with ANZAC on the label don’t need permission, must they strictly must stick to the traditional recipe. Subway restaurants in Australia were forced to change the way it made its version of the biscuit in 2008. The company in turn dropped it from their menu altogether as it wasn’t worth the cost involved in the changes. Miranda Public School made an amazing ANZAC Day tribute short film about two childhood mates who went to Gallipoli puts faith in that cause. If it doesn’t get the hairs on the back of the neck standing up or maybe even draw a tear or too, nothing will! A great ANZAC Day tradition is to bake ANZAC Biscuits. To see the history of the famous Aussie biscuit click here. If you would like to make some of your own, check out the recipe below. Step 1 - Preheat oven to 160°C. Line two baking trays with non-stick baking paper. Step 2 - Combine flour, oats, coconut and combined sugar in a large bowl. - Stir the butter, golden syrup and water in a small saucepan over medium heat until the butter melts and the mixture is smooth. Stir in the bicarbonate of soda. Add to the oat mixture and stir until well combined. - Roll level tablespoons of the oat mixture into balls and place, about 5cm apart, on the prepared trays. Flatten until about 1cm thick. Bake, swapping trays halfway through cooking, for 15 minutes or until light golden. Set aside for 10 minutes to cool slightly before transferring to wire racks to cool completely. Lantern Club will have an ANZAC Day service at 11am on April 25. The service will be Roselands Flames Bowling Club’s Graham Clayton. The 20 min short service will include a playing of the Last post and laying wreathes. A special lunch will be available at MÀZi afterwards.